The trucks filled up as quickly as the kriegies, or former kriegies, could get on them. There was no order, just first come first on board. I was separated from the rest of our combine at that time and didn’t ever see them again. 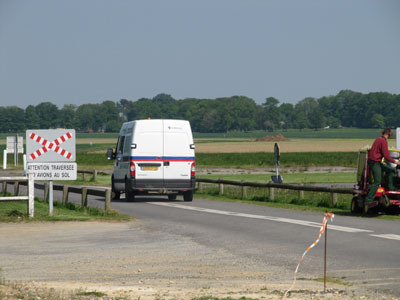 I was taken to Inglostadt, to an air field a short ride from Moosburg. Some of the trucks went to other air fields in the area and we all began the wait for C-47s that were supposed to take us to a redeployment center. While waiting we wandered over to the hangars and saw a number of German planes in various stages of repair. What really got our attention was a twin engine jet fighter. It was probably the one that shot down the B-24s a while back. Not far from the air field was an old German fort that had recently been evacuated. It contained all kinds of military stuff, which was going fast as more and more kriegies showed up. I got a few things, like some German insignia, a couple of knives, a sleeping bag and a back pack. Back at the field we slept in sleeping bags from the fort and had a pretty good nights sleep. Next morning a German Stuka dive bomber made a pass at the field and then came in for a landing. There were three young German flyers on board, saying they wanted to surrender to the Americans instead of the Russians. So we took them prisoner and turned them over to the MPs. On May 8th, 1945 we heard the news that Germany had surrendered and the war in Europe was over. It was also my sister Betsy’s and brother in law Skinny’s birthday. This was also the day that the C-47s came to pick us up. Next stop was a redeployment depot somewhere just outside of Reims. The first thing they gave us was a new duffel bag. I put my looted guns and stuff in it and waited. Here we waited in line for most of the day to strip down to nothing, toss our old clothes into the trash, and shower, one minute to soap up, two minutes to rinse off. Then wrapped in towels we followed the arrows to the medical and dental examinations. Here we also got a typhus shot. After the medics were through with us we were ushered into the quartermasters section, where we received shirts, ties, pants, socks, jackets and a dopp kit containing a razor, shaving cream, toothbrush, comb, and a handkerchief. The clothes were approximately the right size. The shoes took a little longer, but if you knew your size they tried to find it, otherwise you got the nearest size to it. After getting dressed we were sent up to the mess hall where we were furnished a chicken dinner complete with mashed potatoes and gravy, green peas and topped off with ice cream. We were told that we could eat as much and as often as necessary to get the weight back on. Dragging our duffel bags we got on trucks to go to a railroad siding where we were assigned to a hospital train and each given a stretcher to sleep on. There were stretchers mounted four high on each side of the car, so we could sleep on our trip to Camp Lucky Strike* for more processing. At Camp Lucky Strike we were encouraged to eat and rest, but you had to stand in line for everything, meals, showers, clothes and anything else you might have to do. We were encouraged to drink a lot of eggnogs and they were delicious, but you had to stand in line for them too. We lived in big square tents with wooden floors and a screened door for an entrance. This is where we could stash our souvenirs and extra clothes while we were busy standing in line. German POWs were used to police the area and keep the tents clean. I think one of them stole some of my stuff. My Luger and two Hitler Youth knives and a bottle of French perfume were missing. 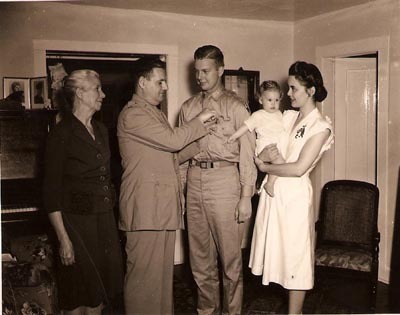 We stayed at Camp Lucky Strike for about three weeks then were sent to another deployment camp to wait for transportation home. We lined up for mess, donuts, coffee, showers and to get on board the liberty ship General George Squire. Yep, we were heading home. After a slow trip across the Atlantic, past the Statue of Liberty and a greeting from a fleet of fireboats spraying water and bands playing, we landed and went to Camp Dix, to board trains for, in my cast Fort Sheridan, Illinois. After processing and getting my back pay, my folks picked me up at Fort Sheridan and I spent the night with them. The next day I boarded the Illinois Central Railroad for a trip to Memphis, Tennessee. I was supposed to catch a train there to Little Rock, Arkansas where Lois and her folks now lived. It was a long slow trip and I tried to think of just the right things to say when I got there. I think it was early afternoon when I arrived in Memphis and I carried my B-4 bag off the train wondering where I should go to get the train to Little Rock. Then I saw her a little way down the platform. She was prettier than I had remembered. I really don’t remember much about that meeting except that we were together. Somehow we found our way to the Little Rock train and sat as close together as possible till we reached Little Rock. When we got there, her folks were there to greet us, and someone handed me a little girl. She was the prettiest baby ever, nothing compared to the mean little kid in the six weeks old picture I had carried around for the past six months. Even Lois’ dad greeted me like he meant it. Probably because the papers all referred to us as the war heroes. Even though I didn’t deserve the title it worked for him. Lynn took a lot of getting used to. It was different. I didn’t know whether to be afraid of her or what. I tried to cradle her in my arms, but she reared back and let me know that she was almost eleven months old and had a mind of her own. I figured I’d watch Lois for a few days to see how to handle things, which wasn’t the hardest thing to do anyway. I was home now and another chapter in my life was about to begin." 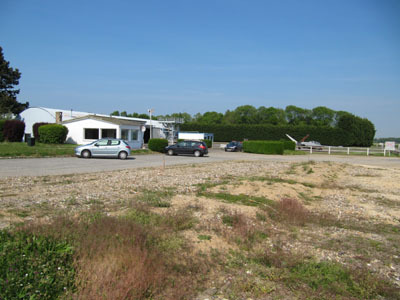 *Camp Lucky Strike was located near Saint-Valéry-en-Caux in Seine-Maritime (Normandy). Here is all what remains of Lucky Strike: a building and a small airstrip for leisure aircrafts. The camp who once hosted 100,000 soldiers was leveled after WWII and returned to cultivation. Eighty nine American soldiers were killed on January 17, 1945 when a train failed to stop and drove through nearby Saint-Valéry terminal railway station. A plaque on the new railway station commemorate the sacrifice of these men who came all the way from the United States to fight for the freedom of Europe. 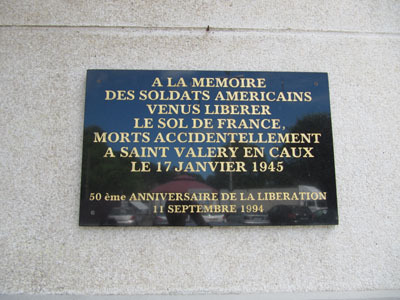 "In Memory of the American soldiers who came to liberate the soil of France and died accidentally in Saint Valéry en Caux on January 17, 1945. 50th anniversary of the liberation September 11, 1994"